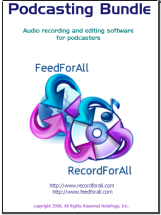 11/20/2008 Huge Podcasting Bundle Discount! Keep in mind that social websites vary and appeal to different audiences. Study the social website to determine the kinds of stories that attract the most attention and interest. If it were easy to predict what would be successful there would be a whole lot of rich people in the world. Determining what will or will not be successful in business is not an easy task, and the same is true for predicting what will be most effective when it comes to social bookmarking. Check out the new packaging. 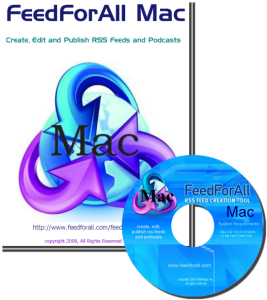 All FeedForAll applications, including FeedForAll, FeedForAll Mac, the RSS Scripts Directory, RecordForAll and the Podcasting Bundle are available in a DVD case with slick new packaging! FeedForAll makes the Learnola list of Top 10 Web Applications. Over the last 10 years of web site development I have seen applications come and go, many are indeed useless and deserve to be cast off into oblivion never to be seen again, but every now and again an application comes along that meets the needs of a web developer, below are listed 10 tools that I use at least every week, they are robust and function well.